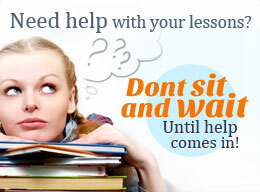 Student's feedback: "I really like the packages and different pricing options they offer at Tutorsville.net. I was able to use my four hour session time for a couple of Algebra lessons on quantitive models and consequences I had difficulty with. I was even able to get tutoring help from the same fantastic tutor Selma every time!" Student's feedback: "Tutorsville.net exceeded my expectations. I needed help in Algebra and was assigned Tutor Subash who assessed my math skills prior to starting the tutoring. By concentrating on my areas of weakness, my tutor 'filled in all the blanks' for me and I was actually understanding formulas for the first time!" Student's feedback: "Tutorsville.net offers the most comprehensive tutoring lessons in chemistry. I have had numerous sessions with both Mr. Frank and Ms. Jennifer and they have helped me to understand the periodic table and quantitative solutions in a way I never could before. I can't thank them enough for their expertise." Student's feedback: He's an easy-going person. I like his lessons. Student's feedback: "With English not being my first language I was really confused on the lessons I had in English covering poetry and knew I needed extra help. In just a few sessions online, my awesome tutor Amber helped me better understand how to interpret any type of poem I was assigned to read." Student's feedback: "It's not easy to find a native speaker tutor, who doesn't speak my native language, but explains everything in English clear and plain. But Frank is the right tutor for this. He can speak distinctly, using the vocabulary familiar for beginners. It's always interesting at his classes and grammar rules look very easy and clear." Student's feedback: Brian saves me every time my college tutor is in bad mood and I hardly understand what he talks about at lectures.